Vote forDerby, WATop Regional Destinations Which are Australia's must-visit destinations? You help us decide. A more isolated and adventurous alternative to more famous Broome, Derby serves as a standout springboard for exploration in its own right, perched on a rugged Kimberley coastline that is home to the highest tidal variation in Australia and which serves as the gateway to the island cavalcade of the Buccaneer Archipelago as well as numerous other WA wonders further afield. One of only three towns in the Kimberley region - along with its brothers Broome to the south and Kununurra to the northeast - Derby differs in that it's even less touristy and that its coastline are less "beachy" and instead expansive flats, showcasing a striking demonstration of the sheer tidal impact that the region experiences. It's not uncommon for the tides here to exceed 10 metres, the impact of which becomes obvious when sitting back and observing from the town's jetty (keep an eye out for crocodiles below) while soaking in one of its famously beautiful sunsets. The town of Derby itself is friendly and welcoming, and is surprisingly large given its population, with a universally warm-to-hot climate characteristic of the region that makes it both an ideal winter getaway as well as mostly avoidable during the summer months. It's well-equipped in terms of amenities, too, given its isolation, with a handful of shops and restaurants to satisfy as a stopover before pushing onwards. Attraction-wise there's enough to see, too, with the likes of its historic Gaol, impressive Norval Gallery and infamous Boab Prison Tree nearby - along with a strong indigenous cultural presence. However, as with the other springboards in the Kimberley region, it's what the town leads to that travellers will likely find most impressive. That's because three absolutely essential Western Australian adventures begin here. Derby's nearby handful of WA's greatest natural wonders each offer their own, incredible spin on the phenomena that makes our largest state such a hub for unforgettable memories. The innumerable rocky islands and bright, turquoise waters that make up the Buccaneer Archipelago are as far-flung a cruise destination as you'll ever come across; ruggedly beautiful, unpopulated and a far cry from the commercialised islands of the Aussie east coast. The full majesty of the region's tides, meanwhile, are on complete display at the stunning Horizontal Falls - the "Horries" feature an onrush of water between two gorges of the McLarty Range that gives the visual effect of sideways waterfalls, and can be explored by both air and sea. Lastly, Derby also serves as the potential start (or end) point for the epic WA road trip of the Gibb River Road and all the associated off-road 4WD adventures it entails. Looking to pay a visit to Derby but not sure what to do? Here are a few of its most essential experiences. What's new in Derby in 2016/2017? Approval was given for a 12-month trial of subsidised twice-weekly flights between Perth and Derby, providing even better accessibility for those wanting to visit. Two new marine parks were declared on the Kimberley Coast near Derby, including the iconic Horizontal Falls - one of its most popular experiences. 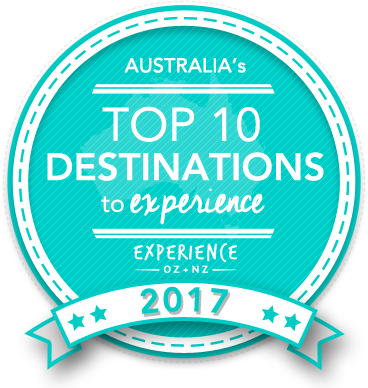 Is Derby Australia's Top Regional Destination to Experience for 2017? Vote now for the chance to WIN an epic trip to one of Australia's top destinations!